In this short guide, we will demonstrate the key features of the encryption: how to encrypt your Firebird database on the server, how to implement an encrypted client connection, and perform backup/restore of the encrypted database. The demo of FEPF is fully functional, with the only exception - it is limited till July 15, 2019. Download archive with the demo version of Firebird Encryption Plugin and demo client application with sources. Firebird 3.0.3 or higher – to test demo plugin it is necessary to use official release 3.0.3 64bit or 32bit, or higher (3.0.4, 3.0.5). Older versions are not supported by the demo version of the plugin. We suppose that all actions are made with 64-bit version of the Firebird 3.0.3+, in case of 32-bit version simply use the files from WinSrv32bit_ServerPart folder. KeyHolder.conf - this is the text file with keys, it is only for developer's usage, it should not be sent to end users! Here, dbcrypt is the name of the encryption plugin, and red is the name of the key to being used. Keys are defined in KeyHolder.conf file. After that, the database is encrypted with server-side authentication: the keys are located in the file KeyHolder.conf. After the initial encryption, we suppose that the database will be copied to the customer environment, where access to it will be done only through the authorized application. To imitate such environment, we need to remove (or simply rename) the file with keys (KeyHolder.conf) from the folder plugins. Without KeyHolder.conf, the encryption plugin will require receiving the key from the connected application. 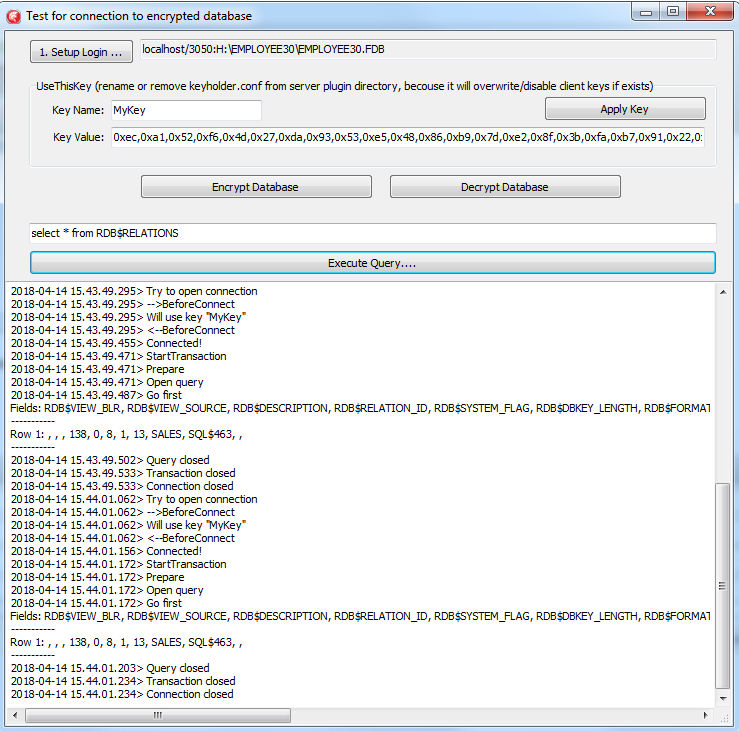 The example of such application is included in the archive with demo plugin – there is a compiled version and full sources for it on Delphi XE8. The code to initialize encrypted connection is very simple – before the usual connection, several calls should be done to send an appropriate key. After that, the client application works with Firebird as usual. Run the demo application to test the work with the encrypted database, it is in the folder CryptTest\EnhancedCryptTestClient\Win32\Debug. Specify database path or alias in "1. Setup Login". This database will be used in the next steps. Specify the key name and value to be used. If you have previously used key RED, set Key Name = RED and copy the key value from the KeyHolder.conf file. Please note: the test application can connect to the encrypted database only through TCP/IP, xnet is not supported. In the example of the client application, all database operations (connection, transaction start, transaction's commit, query start, etc) are made in the very straightforward way to demonstrate all steps of the operation against the encrypted database. You can use this code as an example for the implementing encryption in your applications. The full verified backup with gbak.exe is the primary backup method for Firebird databases. The standard Firebird distribution includes command line tool gbak.exe to perform it, however, it will not work with the encrypted database in the production mode (without keys on the server). After the encryption, only authorized applications can access an encrypted database, and standard gbak is not an authorized application. We all know how important backup and restore for the database health and performance, so, in order to perform backup and restore for the encrypted databases, we have developed gbak.exe with the encryption support, and included it into the FEPF. It is important to say, that this gbak.exe produces the encrypted backup file: it encrypts the backup with the same key as for the database encryption. Let's consider how to use gbak.exe with encrypted databases and backups. To backup an encrypted Firebird database, gbak.exe must provide the key for the server. This key will be used to connect and read the database and to encrypt the backup file. Here, in the parameter -KEYFILE we specify the location of the files with keys, and in -KEYNAME - the name of the key being used. Please note, that the file examplekeyfile.txt has the same structure as KeyHolder.conf. If you apply backup with encryption (gbak -b -keyfile ... -keyname ... ) on the unencrypted database, the backup will be encrypted. Here, we specify the key value in the parameter -KEY, and the name of the key in the parameter -KEYNAME. It is necessary to specify key name even if we supply the explicit key value. The gbak can also restore from the backup files to the encrypted databases. The approach is the same: we need to provide the key name and key value to restore the backup file. If you restore from an unencrypted backup file with encryption keys (gbak -c -keyfile ... -keyname ...) , the restored database will be encrypted. Please contact us with any questions: [email protected].